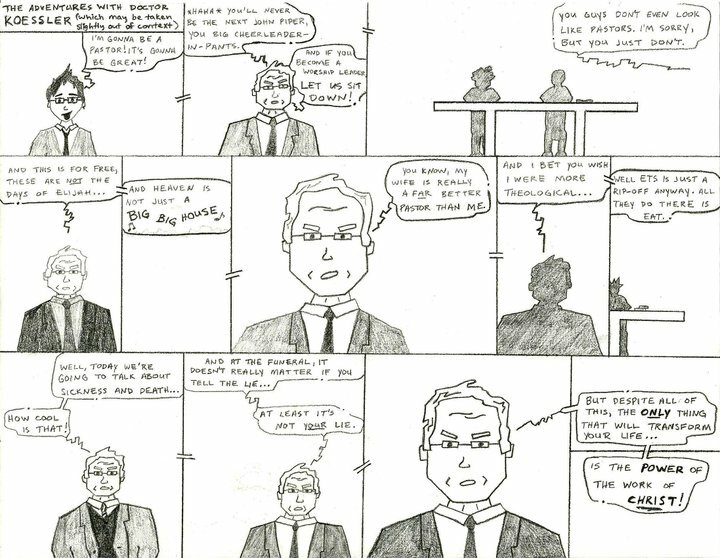 Brant Cole, one of my students in Pastoral Theology, slipped this cartoon in with his final exam. I like it so much I think I will frame it and hang it on my office wall! If you have trouble reading the captions, click on the picture for a larger image. Final exam time is when I discover what my students really learned from me. For example, did you know that congregational churches are mostly anonymous? Baptism contains an illicit promise of transformation. When you visit people in the hospital, you should get to know the nurses. And episcopal churches are organized into caucuses. I do love these guys! I remember a few goodies from that class when I was at MBI. I still get a chuckle. Nice to see things haven’t changed too much in that class though, the cartoon seemed to pretty much hit it on the head. Do you still practice baptism with the class? No, we’ve shifted that to the senior seminar. Too many near drownings among the underclassmen. Wish I were back in your SLC class! John – love the cartoon as it does remind me of my days with you @ MBI. God uses you well to prepare students for real life ministry.